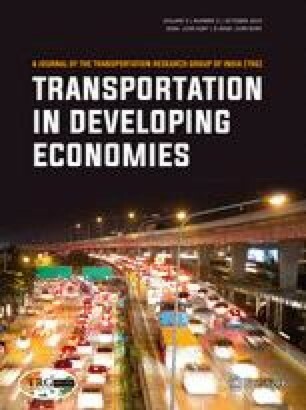 Vehicular traffic on urban roads in developing countries like India is heterogeneous in nature with wide variety of vehicles, both motorized and non-motorized, sharing the same road space. This creates difficulty in accounting the traffic characteristics of the stream. Determination of traffic characteristics is required for flow modeling and capacity analysis which helps in planning and designing new roads and maintenance and management of existing ones. A solution for homogenization of this non-lane-based mixed traffic condition is the usage of passenger car units (PCU). Studies were carried out by various researchers in this direction to develop realistic PCU values for various categories of vehicles taking into consideration parameters like speed, headway, density, projected and influence area, etc. Urban roads are characterized by frequent changes in acceleration–deceleration characteristics of vehicles mainly due to the interaction of vehicles in the stream. This variation in acceleration–deceleration characteristics can be captured in terms of acceleration noise which is defined as the standard deviation of acceleration–deceleration values. Acceleration noise is a better parameter in estimating PCU compared to other parameters which are more suited for homogenous traffic conditions. Acceleration noise is found to follow a normal distribution under smooth homogenous traffic condition; while under mixed non-lane-based conditions, it deviates from the normality. This variation can be measured using skewness and this can be considered as a measure for homogenizing the vehicles on urban roads. In this study, attempt was made to quantify PCU of a vehicle in terms of this variation in acceleration–deceleration. Speed and acceleration were measured using hand-held GPS devices which were mounted on the vehicles. Acceleration noise and its skewness were determined. PCU of a vehicle category was expressed as a ratio of skewness of acceleration noise of the vehicle under consideration to that of passenger car. Since field data were insufficient to account for wide range of volume conditions, micro-simulation technique was employed. A typical four-lane divided urban road stretch was simulated and the traffic characteristics of all the four categories of vehicle were extracted. Traffic volume and composition were varied till the volume reached the capacity. PCU was estimated as per the above concept under varying traffic flow conditions. These values were compared with the values suggested by previous studies and it was found that this method of estimating PCU is able to capture the variation in vehicular composition and vehicular interactions efficiently. Thus, it can be concluded that acceleration noise is a better parameter for representing the PCU values on urban roads.